The Cuisinart name is well known as a great source of quality kitchen tools. The Cuisinart DCC-3200 Programmable Coffeemaker in silver is only one of the many appliances to bear the Cuisinart brand. Will this coffee maker serve you consistently for years to come? Maybe. Let's find out more about it. The Cuisinart DDC-3200 has a 1 to 4 cup setting, but can brew up to fourteen cups in one go. 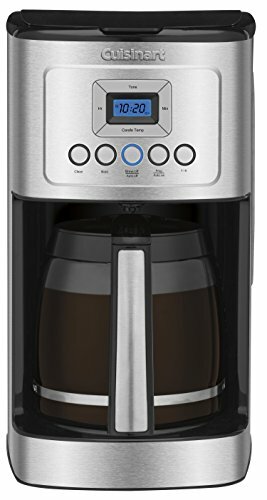 From single early morning drinker to large brunch party, this coffee pot will fill everyone's cup! If you have multiple coffee fans in the house, the brew strength control feature will make it easy to make everyone's preferred coffee. In addition to great regular flavor, you will be able to brew bold coffee on demand! This tool can greet you with a fresh cup of coffee! Simply load the coffee pot, program the clock and set the brew time. Other programmable features include an adjustable carafe temperature. Filtering your water prior to brewing your coffee can lessen bitterness and reduce scale build-up on the glass carafe. Please note that if you use the charcoal water filter, you'll need to remove it before running the cleaning cycle. The gold cone filter included in the Cuisinart Coffee Maker DCC 3200 means you never need to buy paper filters again. This filter features a handle for easy removal from the coffee pot. It's easy to clean and soon ready for the next use! load the reservoir with a mixture of water and cleaning liquid. Many kitchen experts recommend a one to one ratio of water to white vinegar. press and hold the self-cleaning button to run the cleaning cycle. When the cleaning cycle is finished, run two pots of hot water through the machine before replacing the carbon filter to remove all traces of vinegar. How do you clean the removable parts? The filter, filter basket and carafe can all go in the dishwasher. Stainless Steel Finish: The Cuisinart 3200 has a simple shape and elegant stainless steel finish. It will easily coordinate with your other appliances. Brew Strength Control: Not everyone wants to keep multiple strengths of coffee in the cupboard, but sometimes you want a stronger flavor. Thanks to the brew strength control feature, one set of coffee grounds can produce multiple flavors. Charcoal Filters: Even if you use bottled water to make coffee, one more round of filtration can impact the flavor of this crucial beverage. You can change out the charcoal filters when you clean the pot every other month. These simple maintenance steps can keep your coffee pot working well for years. Self-Cleaning Feature: Scale is one of the fastest ways to dull your glass coffee pot and eventually ruin a coffee maker. Because scale or mineral deposits build up on seals and spigots, eventually your coffee pot will leak internally as seals can no longer make the connection they've made in the past. Set a schedule and run the cleaning process regularly to keep your coffee pot working efficiently. Bulk: The Cuisinart 14 cup coffee maker is not a petite tool. While the 14 cup capacity is nice, this coffee pot is over a foot tall and just under nine pounds. If you're used to a tiny coffee pot, or if your counter space is limited, this coffee pot may take up too much room. Reservoir Access: Getting to the water reservoir may be a challenge as the lid to it doesn't open all the way back. You may need to fill the reservoir with a different pitcher, or settle for a bit less coffee. Filter Size: The permanent gold filter is useful and can save you the need to buy paper filters, but it may not hold enough coffee to brew 14 strong cups of coffee. This may be an issue of personal taste, however. Consider using the bold brew setting before overloading the filter with grounds. Burner Coating: The burner of the Cuisinart DCC-3200 may provide more heat with a bit of programming, but it can't hold up to it. Over time, the black coating on the burner may flake off. Investing in a drip coffee maker is getting to be a rather involved decision. It should be noted that the Cuisinart DCC 3200 doesn't offer many bells and whistles. You won't have a milk frother or a built-in grinder like a grind and brew coffee maker. What you will have is a seemingly reliable coffee pot that is easy to clean. Depending on your maintenance routine, this might be one of those items that you can use without worry for years to come.